Today I experimented with some different potato preparations. I am getting ready for my practical exam this coming week. We have to create a dish with three components. The main part of the dish is a sauteed chicken supreme with pan sauce prepared however we choose. The first side dish must be a potato preparation. The potatoes will be Idaho potatoes and we cannot do mashed or pureed potatoes. The other side is a vegetable assigned to each of us randomly right before the practical. I got to work this morning with about 5 pounds of potatoes. Boiling some in cubes, whole, and slicing some into thin rounds. I made different types of potato cakes and one scalloped potato dish. The winner was my scalloped potatoes with smoked mozzarella and sage. First of all, this dish looked beautiful. Creamy yellow/white potatoes, slightly crisped on the edges, and topped with crunchy browned bread crumbs and diced ham. Second, it tasted wonderful. I infused the milk base and potatoes with sage leaves before placing them into the gratin dish. The smokiness from the mozzarella added another dimension to the dish. I browned the bread crumbs with diced ham on the stove top before sprinkling onto the potatoes. This intensified the flavor and brought a contrasting texture, which is important. I have shared my recipe with you for Scalloped Potatoes in the recipe section. It is creamy and can be heavy so it would go best with a lighter protein such as a lean grilled steak, or roasted chicken. If you are like me, you can make this dish your entree. Serve with a green salad and homemade applesauce on the side. Delicious! Check out this story: Rx Spice Rack. I have been teaching this information to my patients for years and was happy to see it publicized. I’m not sure the best recipes with those spices are cookies and cinnamon rolls… BUT the message is one I am on board with. What better way to celebrate the warmer days here in the city than grilling fish? It goes great with a frosty beverage, like a frozen margarita or sangria (my favorite). Cooking at home was a nice escape from the French and Italian cuisine we have been cooking in class. I did not have to use butter, cream, flour, eggs, or brown veal stock for anything! I will share with you the components of a very yummy fiesta style meal you can prepare at home. There is a lot of vegetable chopping if you make the salsas at home. But they will be more fresh, vibrant, and seasoned exactly how you like. How-To: Buy a nice and green plantain. Cut 1/2 inch thick slices. Sprinkle with salt. Heat a tablespoon of vegetable oil in a non-stick saute pan over medium heat. Add the plantains as well as 1 tablespoon agave syrup (or sugar). Reduce heat to low. Cook until one side caramelizes and turns brown. Flip and repeat. 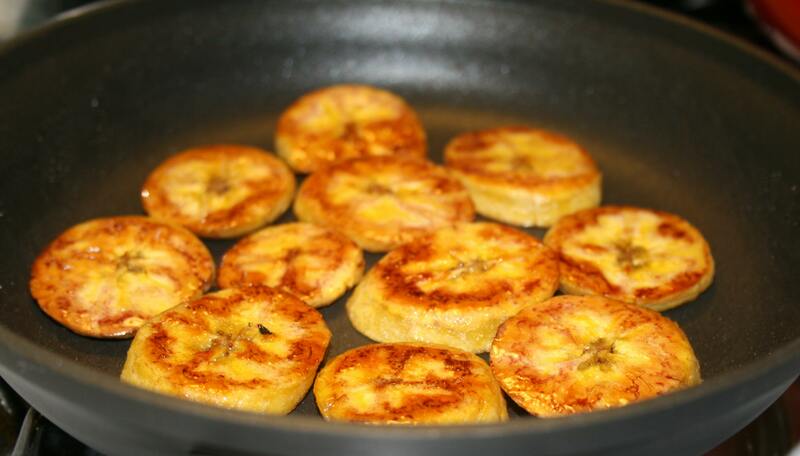 Remove from pan, taste and adjust seasoning with more salt or sugar (depending on the ripeness of the plantain). How-To: Buy two large fish fillets (enough for however many people are eating). Heat a non-stick grill pan over medium-high heat. Brush fillets with vegetable oil and sprinkle with salt. Grill, flipping once, until fish is opaque and cooked through. Do not over cook. Remove to platter and squeeze fresh lime juice on fish (about 1/2 lime per pound of fish). Nutrition Notes: Everything was delicious and healthy! Overall this meal is low in fat and can be low in salt. You can use less oil by utilizing a non-stick grill pan for the fish. This meal is full of fresh vegetables, herbs, and fruit. A wide variety of antioxidants, vitamins, and minerals. Especially since the three salsas are not cooked and therefore most of the nutrients are retained. 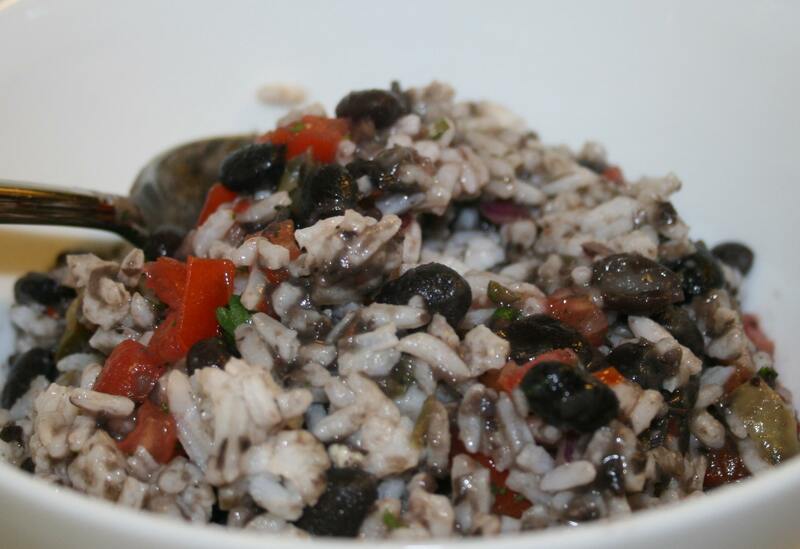 Serving with black beans increases the fiber and protein in this meal. Top scores for nutrition and deliciousness. This weekend at the farmer’s market I bought some wonderful, fresh, farmer’s cheese. I mixed it with a pepper jelly and spread it on sliced French baguette as a snack – delicious! Farmer’s cheese, also called fromage blanc, is creamy and smooth with a mild flavor and texture similar to whipped cream cheese. It is a type of fresh, young cheese, and is usually made from cow’s milk unless otherwise specified. Other fresh cheeses people are most familiar with are ricotta, soft goat cheese, and feta. Why would you want to use farmer’s cheese instead of – say – cream cheese to top a bagel? Why would you use farmer’s cheese instead of sliced cheese? The Good: Farmer’s cheese is lower in calories, total fat, saturated fat, cholesterol, and sodium compared to cream cheese and sliced hard cheese. It is a good source of protein and calcium. The Bad: Farmer’s cheese, like all cheese, is high in fat and saturated fat. Recommendations: Watch serving size to keep fat and calories in check. If you love cream cheese on your morning bagel, but not the calories and fat, try this healthier option. Mix farmer’s cheese with jam or jelly before spreading it on a toasted bagel. I have listed other flavoring options below. You can also find fat-free farmer’s cheese. Uses: On bagels, slices of French baguette, toasted English muffin, crackers, and biscuits to name a few. As a temporary escape from Italian food – I cooked scrambled egg this morning for breakfast. This was also partly due to the fact that the Italian breakfast is espresso or cappuccino and a cigarette. You may not know, but there are important techniques to learn in order to make perfect scrambled eggs. Nobody wants to eat rubbery eggs but eggs can cook very quickly. This turns them from wonderful and fluffy to something that your dog may not even eat. There is a also a formula I have found to making them lower in fat and cholesterol without compromising flavor. Use fresh eggs. See previous post Farm Fresh Eggs. Add about 1 Tablespoon milk or water for every 2 eggs. Break yolks with a fork and stir until mixed. Do not beat. Melt butter in a non-stick saute pan over low heat. Swirl pan so the butter covers most of the pan. When butter is foamy, pour the eggs into the pan. Let them sit for 30 seconds to a minute until a little crust forms around edge. Using a spatula scrap the eggs off the bottom of pan and the sides gently (at this point the eggs will be very loose). Wait a couple of minutes, then repeat the above step. Continue doing this over low heat, cooking the eggs very slowly. It should take between 15 and 25 minutes. You know they are finished when they are fluffy, pale yellow, a little shiny and wet, and cooked through. You do not want browning or completely dry eggs (if they reach this point they are overcooked). When the eggs are done cooking taste them for seasoning. Add shredded cheese (if using) and cook a another minute to melt. When you mix whole eggs with egg whites, the yellow color and egg taste is not lost. I have found that using exclusively egg whites results in a bland and colorless mess. Due to additives, I generally do not use egg beaters or egg substitutes. However, you can buy egg white cartons that are 100% natural. The low-fat sharp cheddar (I like Vermont cheddar) brings flavor with less fat. You will not get the same effect with American or a mild cheese like young Gouda. For egg nutrition see the link above for farm fresh eggs. Sometimes the best cooking requires no cooking at all. Tonight I put together some top notch sandwiches that took a total of 10 minutes. The secrets to accomplishing a sandwich that meets beef burgundy eye to eye in deliciousness is using at least one aged or cured product, a complimentary spread, and really good bread. The aged/cured product I used was Prosciutto di Parma Crudo, brought home from our Italian class. 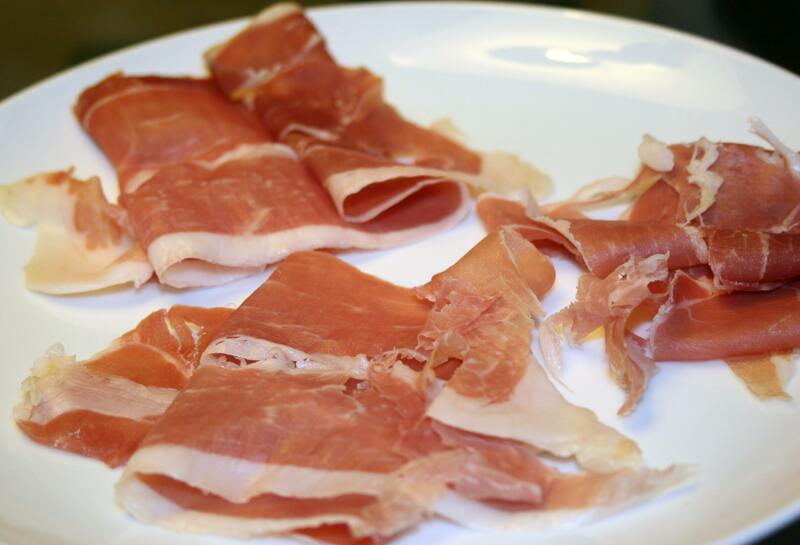 If you are not familiar with this Italian meat, it is ham that is aged, and commonly cured – crudo, then sliced paper thin. The Prosciutto di Parma is regulated by the Italian government. In order to bare this title it must come from a certain pig, in a certain region, and prepared in a certain traditional manner. The result is very flavorful meat that is so soft it melts in your mouth, seriously. The spread of choice was a pesto Genovese we prepared in class. 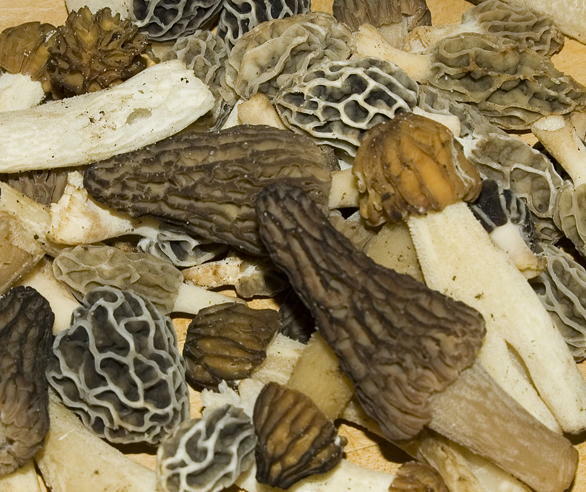 This is one of the Liguria region’s most famous exports. Pesto is a sauce of basil, garlic, pine nuts, olive oil, and cheese prepared traditionally in a mortar and pestle (but in my kitchen – in a Cuisinart food processor with great success). To Ligurians a true pesto consists only of these ingredients, and specifically, from Genovese basil. Today in the US you can find pesto made from all sorts of herb, nut and cheese combinations. The bread was bakery Italian semolina demi baguettes toasted in the oven. Some of the best I have found is fresh baked flash frozen baguettes from Fresh Direct. You reheat these baguettes straight from the freezer in the oven for 12 minutes. Viola! Slice baguette length wise to split open. Lightly spread pesto on the top and bottom of baguette (a little goes a long way). On the bread place a layer of baby arugula leaves topped with 2 slices of prosciutto followed by slices of plum tomato (garden fresh tomatoes in season are best). Finally a layer of fresh mozzarella slices (the no salt kind that comes in a ball). Put the top back on and with a bread knife, cut baguette into smaller sandwiches that are more manageable. Serve with an arugula salad with diced tomatoes, grated Parmesan, and balsamic vinaigrette and you have a lunch or dinner. Finish with a bowl of fresh berries. Note: Order of ingredients is important to maintain the intergrity of the baguette. Also, do not overload the sandwich. Slice your cheese and tomatoes about 1/4 inch thick and use only 1 or 2 slices of prosciutto. I think one sin of sandwich making is the mile high sub – how do you get your mouth around that anyway! This may sound too simple…. it is… but delicious! It also looks impressive and the colors are wonderful. Deep red tomatoes, pink-red prosciutto, bright green pesto and arugula leaves, and shining white mozzarella. To up the wow factor prepare your own pesto sauce. Basil is easy to find in the summertime, as well as great tomatoes. Thanks to California, if you get the inkling you can find basil year round today. A 6-inch section of Italian baguette is 200 calories, 2 gm fat, 0 mg Chol, 470 mg sodium, 7 gm protein, and 38 gm carbohydrates. Tomato slices and arugula add nutrition value but negligible calories and no fat, bonus. This brings a grand total of 403 Calories, 18.8 gm total fat, 4.8 gm saturated fat, 21 gm protein, 30mg cholesterol, and 1418 mg sodium to the sandwich. This sandwich makes a low calorie, low fat (23%), low saturated fat and low cholesterol meal. Downside is the sodium. If you are watching your sodium, I would recommend using only 1 slice of prosciutto and keeping the rest of your meal very low in salt. A reduced sodium ham could also fill in for the prosciutto.